Hey everyone! Sorry for the radio silence, as I mentioned last week I have exams this week so I've been busy studying and it was also my boyfriend's 21st this weekend so I've not really been on my laptop much. My first exam is tomorrow, I'm not feeling overwhelmingly confident but I've done as much work as I can do so we'll see. Today's nails didn't exactly turned out as I had planned. I was given the prompt of 'mod nails' by Divine Caroline and I did a bit of googling on mod patterns and decided to wing it based on a variety of patterns. I'm still not sure whether I like the end result or not. I did end up wearing these for a good week, but only because I didn't have time to take them off! I think they ended up looking a bit like bacon and my flatmate thought they looked like DNA strands, neither were really the effect I was going for! If you like them you can see the tutorial on how to create them here. Haha! I can totally see the DNA strands! It looks really cool though and I love that color combo! Awww...this is so cute! 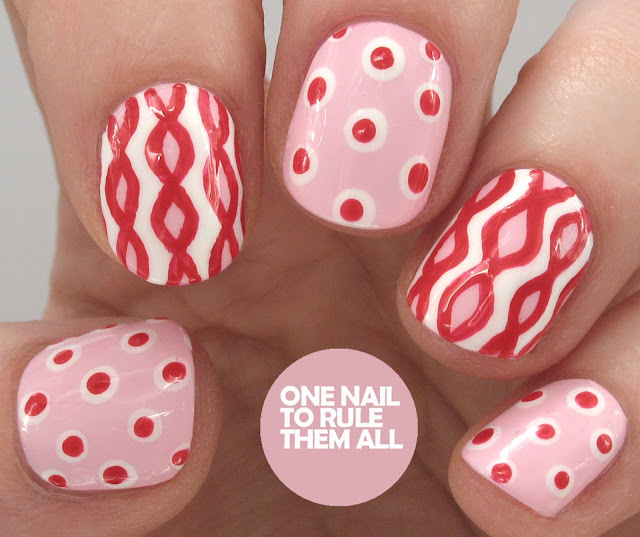 I find this mani cool and creative as well. You nailed it!!!!! I can see DNA but they also have a mod/sixties vibe so you definitely nailed it! I love that pastel pink base! Once I read bacon, I saw bacon lol. But, I think it looks cute!